ILUVIEN is designed to release the drug fluocinolone acetonide for up to three years. 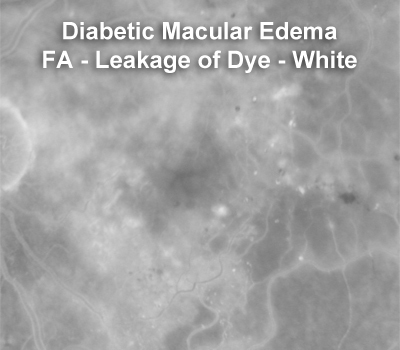 Diabetic macular edema is swelling in the retina associated with diabetes. This swelling can blur and distort the vision. The swelling occurs because the walls of the small blood vessels are progressively more damaged in diabetes, and there is leakage of blood and fluid into the cells of the retina. ILUVIEN is an injectable, non-erodible, intravitreal implant for the treatment of diabetic macular edema, a potentially blinding condition that affects approximately one million people in the U.S. alone. ILUVIEN is designed to release the drug fluocinolone acetonide for up to three years. 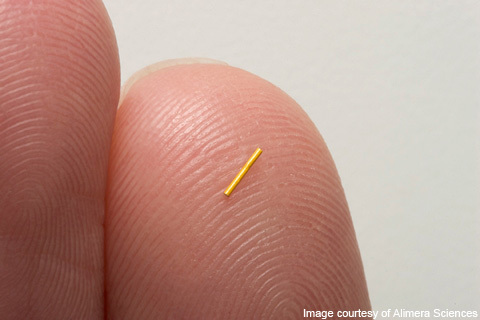 Importantly, the device is small enough to be injected into the back of the eye with a 25 gauge needle creating a self-sealing hole. This insertion procedure is very similar to an intravitreal injection, a procedure commonly employed by retinal specialists. 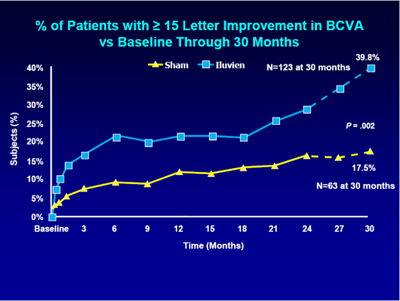 As you can see in the accompanying graph, Iluvein improves visual acuity over a 3 year period in diabetics with macular edema compared to patients who are not treated with iluvein. This treatment lasts much longer than any injectable medication for diabetic macular edema.